Mesotherapy consists in injecting medicine or other ingredients such as vitamins, by microinjections directly to the desired location. Cosmetic Mesotherapy is particularly interesting in that it allows to deposit a concentrated complex of active ingredients and vitamins directly into the area you want to boost, with minimal loss of product. Droplets are painlessly deposited just below the skin (2mm deep) and act quickly and locally. This treatment is much appreciated for both its simplicity and efficiency. The main indication of aesthetic mesotherapy is to revitalize and tone tissue. Our two most popular treatments are meso-hair for the scalp (against hair loss and dull, thin hair, receding hair line) and of course the mesoglow for the face, neck & cleavage . In just a few days your skin radiates and glows again, cutaneous metabolism is restarted, hydration is restored. Especially appreciated after a straining period, or following wintertime, when our skin really could use some boosting. 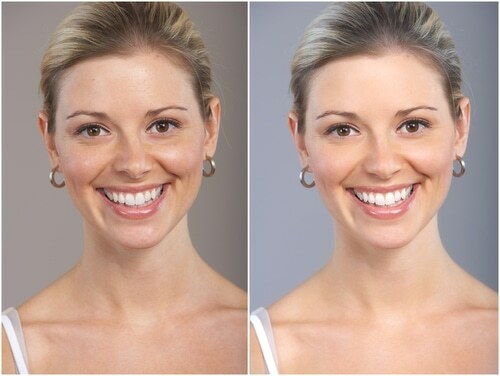 A mesotherapy session lasts about 20-30 minutes. Skin is cleansed and disinfected, your clothes protected. Your specific mesotherapy cocktail is prepared in sterile conditions, all injection material is of course disposable. The treatment is extremely well tolerated. Not painful, easygoing, with a little music in the background, some patients even fall asleep during the session... We can choose to either inject by hand or use a auto-injector (mesogun). The injections are very accurate and depth is well controlled, so injections remain very superficial and leave virtually no marks. There is no special care to apply after the session and you can resume your activities immediately. No downtime required. Most patients find mesotherapy both very pleasant and quite painless. The mesotherapist can apply a local anesthetic spray if you wish, but mesotherapy injections are very superficial and perfectly bearable without it. The mesotherapist will adapt depth of injections to ensure maximum comfort. The nutrients captured under the skin are gradually absorbed by the skin where they are most needed, without overdosage or side effects, thus efficiently restarting cutaneous metabolism, helping in the functioning of the cells and increasing their vitality, with lasting effects. In our experience, injecting regularly, at a given depth, and avoiding papules (bubble on the surface of the skin), is not only more pleasant for the patient but above all more effective than all the other techniques. First of all, the manual approach of making a kind of fast « nappage » hardly deposits any product under the skin, almost everything is lost at the surface, thus making this a less than efficient treatment, and there is a serious risk of leaving scratching marks from the needle.As for papules, we find them useless, not only unsightly and painful, but it is also proved that the excess product captive under the surface of the skin is eliminated, purely and simply (overdosage). It is a well known fact that cells can only use a small amount of vitamins at a time, and that the rest is lost. For this reason we avoid this technique which serves no purpose and marks the skin for several days. Finally, we advise against the use of derma-rollers (used by beauticians and other non-medical personnel, or sold over the counter), before applying a mesotherapy cocktail in the hope that it will penetrate the skin. Indeed, these rollers damage and seriously irritate the skin, resulting in a few days of raw redness and a very real risk of infection. 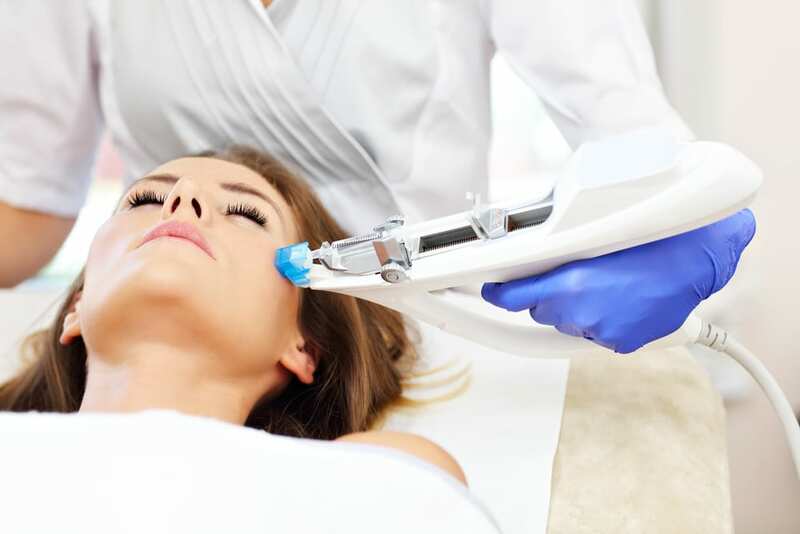 Dermapens and other micro-needling techniques are also highly aggressive and do not improve skin condition, on the contrary, their whole purpose being to puncture the skin numerous times and hope against all odds that it will improve skin texture. This is why we recommend (and exclusively practice) mesotherapy microinjections of vitamins , preferring whenever possible a mesotherapy injector (mesogun) to manual techniques, for its gentleness and precision. The microinjections of vitamins and other useful ingredients are regular, at a maximum depth of 2 mm for the face, 4 mm for the scalp. The nourishing effect diffuses on a surface of approximately 1.5 cm, thus benefits widely to the whole area with fewer injections, leaving no marks and no pain whatsoever. Mesotherapy works quickly, you can see the effects (rehydration, good looks, improved skin texture) after approx. one week, and they are long-lasting because the nutrients help the cells function and improve their vitality . In the case of hair loss, a marked decrease is observed after a few weeks, and a gradual regrowth occurs after 2-3 months. Nothing special is to be done after the session. All activities are authorised after this treatment. No need to avoid the sun. No down time. Hematomas are extremely rare. The slight odor of vitamins is pleasant, but if it bothers you, you can wash your face to get rid of it more quickly. We usually recommend letting your face breathe and take advantage of the "serum" effect, however it is not an obligation. Indeed, over 90% of the product is captive under the skin, its work has already begun, diffusing its nutrients in your cutaneous cells. Depending on your specific needs, Dr. Roux may recommend a rythm best adapted to your needs. Usually, a series of mesotherapies are proposed close together as an onset, followed by maintenance sessions spaced 1-3 months. No formal contraindication for this treatment, except in case of known allergy to one of the components, taking anti-coagulants, an excessively damaged skin, suspicious lesions on the skin, pregnancy. We offer a number of top quality revitalizing and nourishing cocktails , perfectly sterile, containing hyaluronic acid, vitamins, minerals and oligoelements. Results are mostly tightening and provide better complexion and natural glowing. We only use injectables of irrefutable quality prepared by renowned laboratories (Revitacare, Aesthetic Dermal, Toskani cosmetics or Filorga). In our Clinic, we have developed specific magisterial preparations, to treat various problem areas (we can combine different "cocktails" to treat separately the face, neck, décolleté or hands. Also known as meso-firm, this complex of vitamins meets the needs of sagging skin tissue, with fine lines and loss of elasticity. Its "lifting" effect, stimulates collagen, increases firmness and hydration of the skin. Can be injected in any area of the face or body in need of a lift and improved elasticity.The mesolift complex contains Hyaluronic Acid, DMAE, Sodium DNA, elastin, vitamin C, minerals + organic silicon. Among our mesotherapies most in demand, mesoglow corrects dull, dehydrated or impure skin. It is anti-oxidant and detoxifying, moisturizing and bio-revitalizing. Mesoglow provides luminosity and a natural glow to the face. Your skin becomes visibly more beautiful, brighter, you look more fit and more rested. Mesotherapy provides a clearer complexion, brightens up your skin and provides a natural radiance. This preparation contains Hyaluronic Acid (smooths skin and retains water), vitamins A, B3, B5, B6, B7, C, E, (Nicotinamida, Dexpantenol, Pyridoxine, Riboflavin, Thiamine, etc.) Amino acids, minerals (Potassium, Magnesium) + smoothing active ingredients (organic silicon, DMAE). A unique revitalizing cocktail to improve the appearance of puffiness, dark circles and lines in the periorbital area. This cocktail specially formulated for the eyes contains Organic Silicon, Artichoke Extract, Gingko Biloba, Sodium Hyaluronate, + Vitamin C, Troxerutin, Palmitoyl Tripeptide-1, Palmitoyl Tetrapeptide-7, + Acetyl Tetrapeptide-5. We can also add Argilerine, which acts like botox to correct expression lines and fine wrinkles around the eyes. Treats damaged skin (wrinkles, dehydration, loss of elasticity), sun, pollution, tobacco, etc. Improves complexion, hydration and texture. The mixture contains elastin, vitamins B1, B2, B5, C, DMAE, mimosa teniuflora (regeneration of epidermal tissue), centella asiatica (regenerating and healing properties). Targets fine lines: vitamins B1, B2, B5, B6, B12, organic silicon, DMAE, carnitine (firmness), pyruvic acid (stimulation of collagen), sodium hyaluronate (fixed hyaluronic acid), argireline (calms contraction wrinkles). An intensive protocol (every 2 weeks until noticeable improvement) will only be useful for very dehydrated or very damaged skin. Subsequently, mesotherapy every 2 or 3 months is largely sufficient to ensure a very effective and lasting skin tone and vitality. Indeed, our preparations are highly concentrated in active ingredients and vitamins, and their diffuse action continues for about 1-2 months. Then, the skin does not suddenly lose its vitamins and nutrients, they simply decrease gradually and discreetly. For this reason, a new session 2- to 3-months later allows you to maintain an obvious skin benefit and a recommended optimal vitamin level throughout the year.For people prone to hormonal or seasonal skin dryness, it is recommended to schedule a mesotherapy session before the arrival of winter, in early spring and late summer, to support their skin during these difficult periods. This is generally enough to ensure a whole year without worry. Vitamins targeted for beautiful hair, with improved texture and luster (to which can be added molecules effective against hair loss, as well as vasodilators to improve micro-circulation) are injected into the scalp and allow a revitalization of the hair, effective prevention of baldness, and put a stop to hair loss (caused by stress, anxiety, pregnancy, menopause, etc.). Very efficient for receding hairline, decreased hair density, hair loss, but not in case of baldness when hair bulbs are no longer active. The vitamin cocktail contains: Sabal Serrulata + Iron + Taurin + Panthenol + Glutathione + Thiamine + Biotin + Pyridoxine + Coumarin + Routine. The active ingredients added to this mixture, according to the needs of each are: a supplement of vitamins B2, B6 and B12, injectable bepanthene, injectable minoxidil, and injectable dutasteride (for gentlemen only). It should be noted that dutasteride in injectable form does not cause any of the side effects observed with the pills of finasteride / dutasteride. In fact, injected only in the scalp, in precise quantities and well tolerated, without overloading, the product does not diffuse elsewhere and does not cause side effects. In principle, one will initiate hair loss control by an intensive cure of 4 sessions every 2-3 weeks (to stop hair loss, activate regrowth mechanism), followed by a maintenance session every 2 months.The protocol will then be simplified, according to the results and completed at home by food supplements and local products which will be advised to you individually. Also called Meso-Drain: micro-injections of draining substances on thighs, following the lymphatic system. Triggers lymphatic drainage and facilitates the removal of fat degradation products. Useful to complete a lipolysis treatments. Mesodissolve injections are superficial (5 mm) and we use a mesogun for increased comfort. Drainage induced by the treatment occurs during following days with no side effects. Small bruising is possible, some heat and tingling may appear after the session, which disappear on their own. Excessive heat should be avoided in the days following a meso-drain session. Its "lifting" effect, stimulates collagen, increases firmness and hydration of the skin. Can be injected in any area of the face or body in need of a lift and improved elasticity. The mesolift complex contains Hyaluronic Acid, DMAE, Sodium DNA, elastin, vitamin C, minerals + organic silicon. Mesolift or mesoglow to complete PRP results, thanks to vitamins and hyaluronic acid, for face, neck and cleavage.